As I mentioned last week, we rode a lot of roller coasters on our trip. One thing that amused all of us was a sign posted at the top of the big hill at the start of almost every coaster. Stretched right across the track was a sign that read, "Do Not Stand Up." What?? Who in their right mind gets to the highest point of a roller coaster, hundreds of feet in the air, supported by only a narrow track, in a moving vehicle that is poised to fly down the hill any second and decides they want to stand up? We speculated that maybe no one has ever stood up and the signs are simply the park's way of protecting itself against lawsuits should someone ever try. Then again, maybe some people actually are that crazy and have stood up while riding. Either way, the mere presence of the signs had me thinking about how we sometimes need help to know what is good for us. Sometimes we need advice from other people who are looking at situations from a different angle and who can see things we can't. Take Moses, for example. He had led the Isrealites out of Egypt and the people were looking up to him as the authority among them. That meant, in part, that they brought all of their disputes to him so he could settle them. As he explained it, "When a dispute arises, they come to me, and I am the one who settles the case between the quarreling parties. I inform the people of God’s decrees and give them his instructions" (Exodus 18:16). All well and good, right? Not quite. Moses' father-in-law, Jethro, observed the process for one day and immediately recognized a problem with the situation. He said to Moses, "What are you really accomplishing here? Why are you trying to do all this alone while everyone stands around you from morning till evening?...This is not good!... You’re going to wear yourself out—and the people, too. This job is too heavy a burden for you to handle all by yourself" (vv. 14, 17-18). He went on to tell Moses to appoint others to hear the lesser disputes, freeing himself up to hear only those major disputes that truly needed his attention. After Moses took the advice, the process was better for everyone. The people weren't waiting so long to have their issues resolved and Moses wasn't wearing himself out trying to deal with everything all by himself. Do we heed the advice of others? When someone tells us that we need to do something differently, do we consider whether or not they might be right? Or do we continue on as we have been, convinced that our way is the only way? And if someone tells us that what we're doing is dangerous in some way, do we immediately think they're trying to take away all our fun or do we stop and think that maybe they are trying to protect us? Not every piece of advice we receive will be helpful, but if we don't stop to consider it, we'll never know. Sometimes we're so close to a situation we can't see the problems in what we're doing. Or maybe we're so excited that we don't slow down long enough to see the potential dangers. In both situations, it's good to heed the warning signs or listen to the wise advice of the people around us. 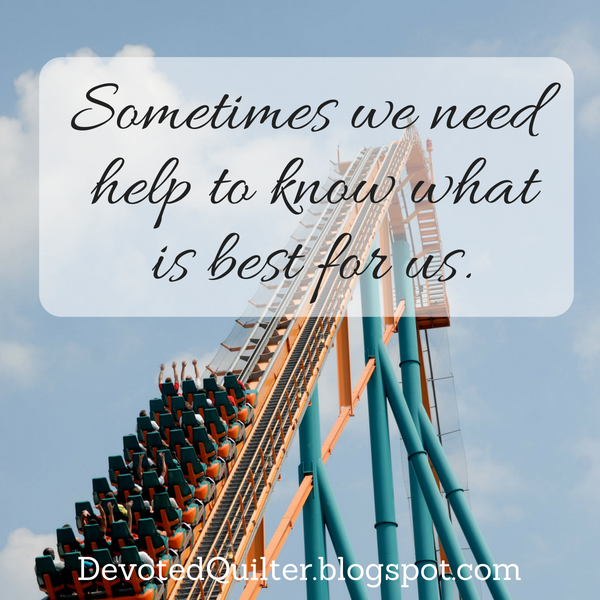 Much as we like to think we always know what is best for us, sometimes we need help.